Historians have generally passed quickly over Louisa Adams. She is known as the somewhat unhappy, somewhat difficult wife of the sixth President (and daughter-in-law of the second). In the enormous files of the Adams family papers repose many of her unpublished writings—plays, poems, memoirs, and, almost unnoticed until now, two brief accounts of her remarkable journey in 1815, alone except for servants and her eight-year old son, from Saint Petersburg, Russia, to Paris, there to meet her waiting husband. From these, the English historian Michael O’Brien has fashioned an irresistible adventure story and a brilliant portrait of Louisa Adams that ought to rescue her for good from half exotic obscurity. Novelists sometimes insist that there are really only two possible plots in literature: somebody goes on a journey, or a stranger comes to town. And these, of course, are the same plot, from two different points of view. O’Brien, writing history like a novelist, begins with the first. It is February 12, 1815, five o’clock in the afternoon in Saint Petersburg, and forty-year-old Louisa Adams is just climbing into her berline, a large enclosed four-wheel carriage drawn by six horses. She intends to travel in this carriage for approximately forty days, over some two thousand miles, going on a good day between six and nine miles an hour. She is leaving Russia, and the court of the Tsar, after a residence of six years during which her husband served as American minister plenipotentiary, because John Quincy Adams is in Paris now, after helping to negotiate in Belgium a treaty between Britain and the United States to end the War of 1812. And he has summoned her. The first half of Mrs. Adams in Winter reconstructs the journey in fascinating detail—we learn the distances between post stages, the ritual by which new horses and postilions are hired at each new inn, the medicines, tools, weapons that a long-distance traveler must pack. We shiver with Louisa as she contemplates the somewhat dangerous face of her servant Baptiste, we marvel at the crazy quilt of passports and papers she carries and the different coins she must use—thalers, groschen, pfennigs, ducats, florins, kreutzers, louis d’or—and such is O’Brien’s empathy and skill, we feel both her vulnerability and pride as she jolts and bounces over ice and snow, a woman on her own in a vast, unfriendly, frozen world, but in control for once, making her own decisions in life. O’Brien pauses often to describe the towns she passes through. Some of them suggest aspects of her background and character. Wittenburg, where Martin Luther nailed up his ninety-five theses, leads to a discussion of her religion. In Dorpat she does not bother to stop and see the university, because universities were places for men only. A highly theatrical person herself, in Riga she happily attends a play, though among her husband’s many rules of life was one “to make no acquaintance with Actresses.” Seeing from the road the castle of a scandalous Englishwoman, she is reminded of the not quite respectable sexual behavior of her own mother and grandmother (and her own tense and dutiful virtue). Entering Prussia, she recalls her miscarriages, the death of her infant daughter, the episode when someone gave her a box of rouge and her husband commanded her to wash it off after she was bold enough to sample it. But on the road she turns out to be somebody. 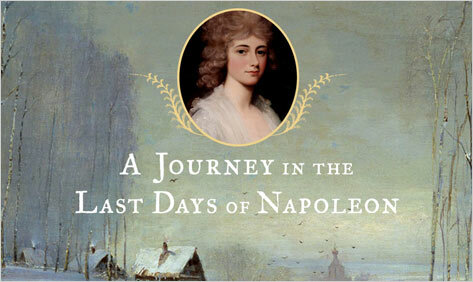 For two-thirds of the way through her journey she learns that Napoleon has escaped from his exile on Elba and is advancing toward Paris with fourteen thousand rebel troops. A woman traveling alone through a scene of civil war, she is warned in Frankfurt not to continue. And truly, she had already witnessed enough evidence of Napoleon’s destructive genius. At Hanau her route had taken her through burned villages and fortifications, past wrecked houses and immense piles of bones in the fields from a murderous battle two years earlier, after his retreat from Moscow. Max Byrd is the author of many historical novels and a Contributing Editor at the Wilson Quarterly.